Engineers are a creative bunch by nature. When faced with a challenging situation, their desire to find a solution is second only to the creativity and analysis they use to overcome that obstacle. 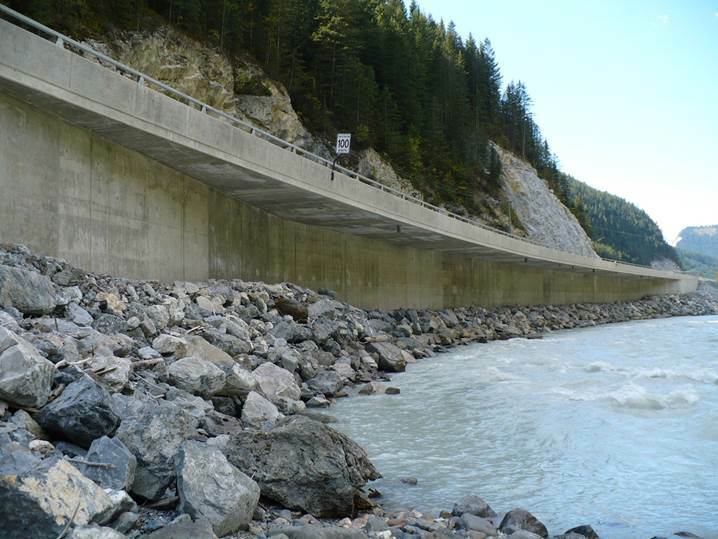 The terrain of British Columbia has no shortage of dramatic and difficult terrain for our highway engineers and they are full of innovative solutions. Engineers envision highways carved out of mountainsides and bridges that span awe inspiring gulches and make those visions a reality. Some of their engineering feats are visible to everyone (think of the iconic Lions Gate Bridge or the impressive Squamish Pedestrian Overpass). Then there are other marvels that give you the safety and support you need, without you even knowing they are there. 1. 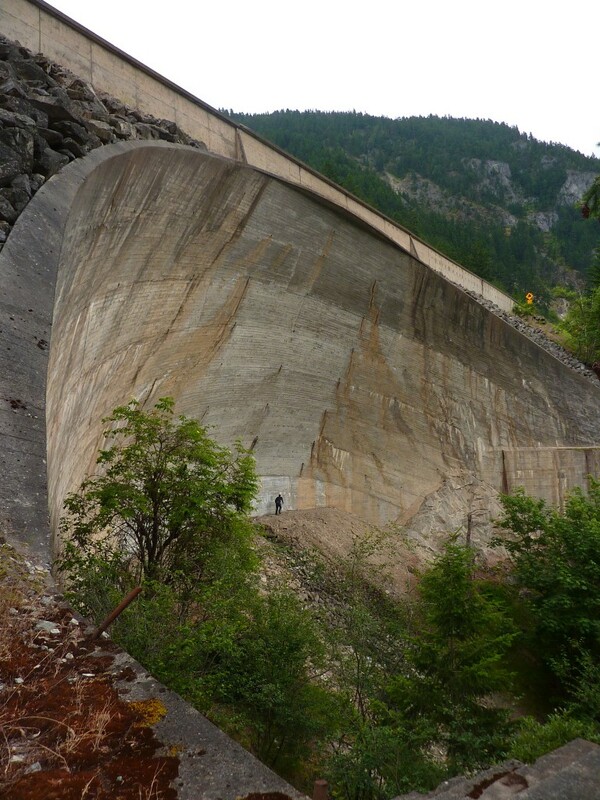 Known unofficially as the “Hollywood Bowl”, this huge concrete supporting structure (seen above) was built in the 1960s during the construction of the Trans-Canada Highway. Check out the person standing at the bottom of the bowl for scale. Impressive, isn’t it? From the highway there is no indication that you are travelling over this bowl; the only hint of what lies below is where our typical concrete roadside barrier changes to cast-in-place concrete barrier as you cross over. 2. Speaking of magnificent landscapes, the Kicking Horse Canyon portion of the Trans-Canada Highway (located between Golden, BC and Lake Louise, Alberta) passes through some of the most breathtaking scenery in Canada. A part of the Highway 1 Four-Laning Program, this stretch of road provided engineers with a big selection of topographical challenges, some of which you might just cruise right by without even noticing. For example, this innovative cantilever structure, built out over a bend in the Kicking Horse River eliminated the need for two separate bridges at the site. Cool stuff, don’t you think? 3. 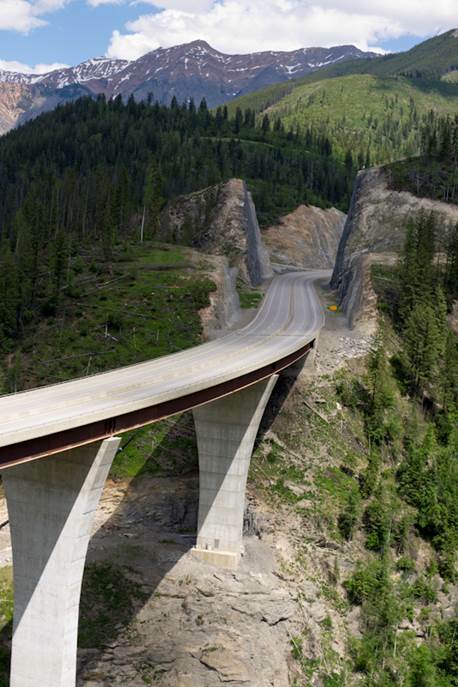 From down low to up on high, the beautiful Park Bridge feeds motorists through “the cut” in the Kicking Horse Canyon stretch of Highway 1, near Golden. This lofty structure is awe inspiring to say the least and the route is so seamless, you might not even notice what’s below, while you’re travelling it. 4. Just off the Trans-Canada Highway on Vancouver Island is the historic Kinsol Trestle. Completed in 1920, this is one of the tallest free-standing and most spectacular timber rail trestle structures in the world. At 187 metres in length and standing 44 metres above the Koksilah River, the Kinsol is truly an incredible structure. We worked with the Cowichan Valley Regional District and the federal government to rehabilitate the structure in 2011. It’s now a key part of the Trans-Canada Trail on Southern Vancouver Island and a thrill for everyone to experience. Do you have a favourite unseen engineering marvel in BC? Let us know in the comments below. Why does BC keep barricading off all the pullouts in the Fraser and Thompson Canyons? Great vieeing spots no more in a province so reliant on tourism! SMART MOVE. Thanks for your question about barricades at the pullouts along the Fraser and Thompson Canyons. There could be a variety of reasons that a pullout is blocked. It could be a seasonal closure during winter while pullout space is utilized as snow storage. The pullout might be closed permanently due to rock fall hazards above the pullout, or the area may have become prone to vandalism on public or private properties. The closures could also be due to a variety of other reasons, generally related to public safety and/or ministry operational needs. Should you wish to provide details of a specific location/pullout that is blocked, we would be willing to seek further information about that. I love the old Alexandra Bridge on the Fraser, every time I go by I try and stop and take a walk down. I was born in the mid 50’s and lived in the Interior. With grandparents on the Gulf islands we traveled “The Canyon” regularly during the Gaglardi road building years. Years that are still cast in the retaining walls, abutments and tunnel portals that modernised the route. Those concrete monuments were the cutting-edge engineering of the day but are rapidly reaching the end of their lifespan. As a child I watched the 1960’s engineers punch holes through mountains to create a modern marvel. In the 1980’s I watched the technology of that age slice hours off the trip to the coast by slicing through the Coquihalla and most recently witnessed the great advances on the Sea to Sky and Kicking Horse. With the increasing issues we are seeing on the Coquihalla when can we expect see a modernisation of the Fraser Canyon and lower Thompson? There must be an acknowledgment that The Canyon can’t handle the traffic volumes that divert from the Coq during its increasingly frequent winter closures and for that matter the commercial volume that use that route daily. Hi Ian and thank you for your comment. We take the safety of the travelling public very seriously and are aware of increased traffic volumes over much of the province, including the Coquihalla. 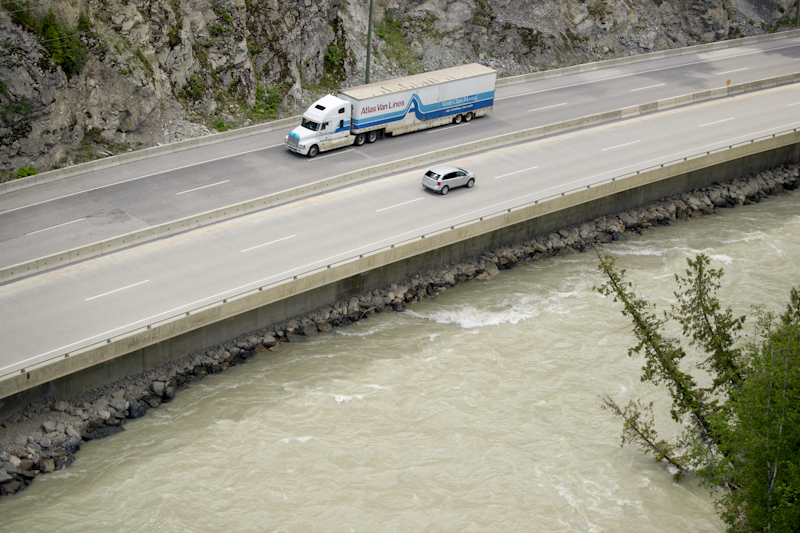 When closures happen on Highway 5, the Fraser Canyon is an alternate, however Highway 3 also serves as an alternate to the Fraser Canyon Route. That being said, there are no significant improvements on the radar for the Fraser Canyon at this time. Paulson Bridge on Hwy 3. How did they do that? The Paulson Bridge is a steel girder span constructed by the Dominion Bridge Co and opened in 1962. We will keep our eyes peeled for photographs of it during construction for you! I’d like to see some impressive engineering feats completed on the Telegraph Creek Road, which I travel several times throughout the year, in all seasons. Hi Hazel, thanks for connecting with us and letting us know. Is there anything specifically you are concerned about? We can share forward with the local area office. I wonder if the KVR trestle behind Summerland would fall into this category. I believe it is one of the largest (highest?) in North America? Great suggestion. 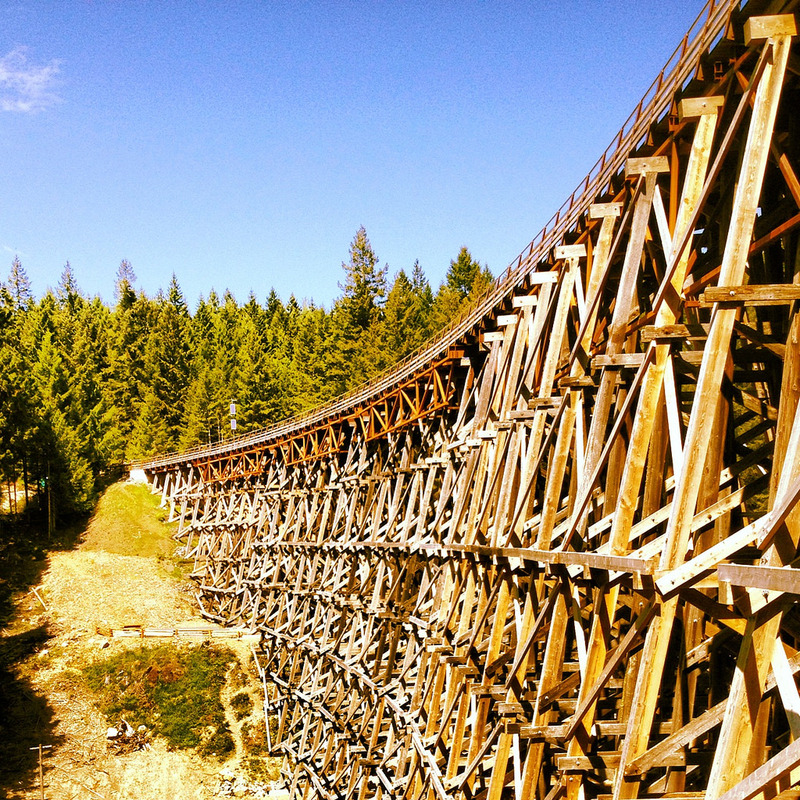 The Kettle Valley Railway trestles were some of the highest when they were built. Some of them were burned during the fire of 2003 but have been rebuilt and can be biked on today. The Trout Creek crossing in Summerland is spanned by a bridge, not a trestle. Many people use “trestle” to describe, or perhaps differentiate a standard bridge from.one used by a railway/railroad. Easy way to know which is which: Bridge carries the whole load, a Trestle does not. See the Kinsol Trestle above. At any time, the load is being carried to the ground at all times. All construction to cross a gap are bridges, but not all bridges are trestles. The Othello Tunnels & Bridges outside of Hope Adjacent to Hwy 5, an amazing engineering feat in its day. Thanks for your positive feedback Lin – we appreciate hearing from you! Nass river Bridge. Constructed entirely of wood (though the guard rails are now steel)by the BC Forest Service. Thanks for sharing the video of the BC Forest Service Crew It certainly looks like a challenging project in a remote place. the Kinsol Trestle was started in 1911 but not completed until 1920. Thanks for pointing out the distinction between the bridge being “built in 1911” as the blog stated, and the bridge being completed — which did not actually happen until 1920. I have changed the blog to read that the bridge was completed in 1920. Hope you’re having a great summer season at the Shawnigan Lake Museum. We are currently working to improve the reading experience of TranBC for visitors across all devices. Thank you so much for your feedback. Great examples. There are so many more engineering and construction wonders that are often left unnoticed. I would also recommend the William R Bennett Floating Bridge across Okanagan Lake in Kelowna. One of only a small number of floating bridges in the world and I’m sure many tourist cross the bridge without realizing that it is a floating structure. Additionally, I would also add the Sea-to-Sky Highway from Vancouver to Whistler, with the down-slope construction of numerous cantilevered sections of highway…many unseen by motorists. A beautiful drive! Where is the bowl and why was it constructed? We aren’t revealing the location of the bowl for safety’s sake. It was constructed in the 1960’s as a part of the Trans Canada Highway. Band shell construction like this was very popular during the day but this is a one of a kind structure on BC Highways. As kids we investigated Hollywood Bowl with my dad. It was one of the most amazing things I have seen and as I grew older, and realized what an engineering feat it was, I was awestruck. Safety reasons?!? That’s a joke… there’s a well built trail with steps built in leading down to the base of the bowl. TransBC just wants to cover their but for liability sake (damn nerfed world!). Of course there are steep slopes, rocks, brush, mosquitoes, etc nearby so it is possible for someone to get hurt (you might also get hurt next time you get up to go pee). Sorry to disagree but safety concerns are no joke. Rosemond Bridge past Jordan river. Its a rare wooden arch only one I know of especially here in B.C. by far my favorite structure. Thanks for the tip Rees, we’ll be sure to check it out next time we are in Jordan River.